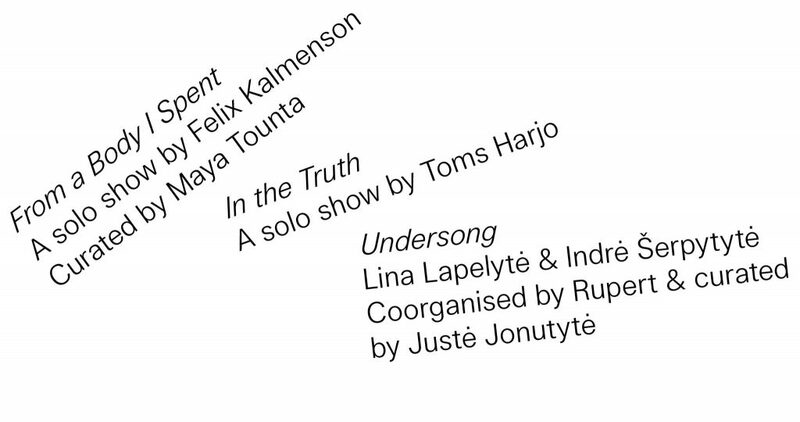 Undersong is an exhibition of Lithuanian artists Lina Lapelytė and Indrė Šerpytytė organised by the Vilnius-based art centre, Rupert. Following Rupert’s commitment to supporting a young generation of Lithuanian artists in reaching an international audience, the art centre shows two renowned Lithuanian artists at the first major presentation of their work in Latvia. With a professional background in music, Lapelytė’s performances are often constructed as songs, or more specifically, sutartinės (traditional Lithuanian polyphonic songs), where melodies are symmetrical and consist of equal-length parts, and where repetition is key. This background in music informs Lapelytė’s pieces for this exhibition, all of which were first shown in her solo show at Rupert (November-December 2017): Pirouette and The Mickey Tail, and a sound installation, The Trouble with Time, which comprises of a complex layering of songs composed for texts written by a selection of artists, as well as sounds recorded with Rhodri Davies at the French pavilion from the 2017 Venice Biennale. These works examine our relationship to ageing, and to physical, mental and professional endurance. Lapelytė explores how we can negotiate social and cultural norms through collaboration and performance. Lina Lapelytė (b. 1984, Lithuania) is an artist living and working in London and Vilnius. Her most recent large-scale work is the opera Sun and Sea presented at the National Gallery of Art, Vilnius together with Rugilė Barzdžiukaitė and Vaiva Grainytė (Vilnius, 2017). A German version of the work will be presented at the Staatsschauspiel Dresden in 2018. Lapelytė’s performance, Candy shop – the Circus was recently shown at the FIAC (Paris, 2017) and Barcelona Museum of Contemporary Art, Barcelona. Other recent shows and performances include those at Rupert, Vilnius (2017); 1857, Oslo (2017); Kunstraum, London (2017); Venice Architecture Biennial, Venice (2016); CAC, Vilnius (2016); Focal Point Gallery, Southend-on-Sea, UK (2016); Nylo, Reykjavik (2016); Hayward Gallery Touring, UK (2015); Block Universe, London (2015); Serpentine Galleries, London (2014); Baltic Center for Contemporary Art, Newcastle (2014); David Roberts Art Foundation, London (2014/2017), and the Queen Elizabeth Hall, London (2014). In 2018 her works will be presented at the Baltic Triennial, curated by Vincent Honoré. The exhibition is partly sponsored by the Lithuanian Council for Culture and the Ministry of Culture of the Republic of Lithuania.